1. Do not try anything new the day of the race. This includes food, clothes, shoes, etc. If you have new shoes, make sure you have worn them for at least two weeks prior to the race. If you've bought yourself new clothes for the race, make sure you've done at least one test-run in them prior to race day. You do not want any surprise chafing or riding up. Do not eat anything new prior to the race, including the day before the race. If you are used to eating a bagel with peanut butter, for example, prior to your long training runs, eat this prior to the race, too. You do not want to surprise your body with something that it might not agree with. The same goes for beverages. If you have never tried the sports drink that is provided on the race course, consider skipping it and sticking with water. 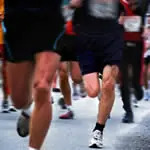 It is always to good idea to find out what sports drink will be provided at the race and use that during your training runs so that your body gets used to it. More: Shop for a new hydration belt. 2. Pick up your race packet early. Some races offer packet pick-up prior to the race on race day. If you have the option to pick it up the day before, however, take advantage. You do not want to have to worry about anything extra the morning of the race. 3. Lay out all of your clothing and gear the night before the race. Attach your bib to your shirt and your timing chip to your shoe, if you have one, so that you have less to worry about in the morning. Laying everything out the night before helps to ensure that you have everything you need and do not forget an important item that you might skip over in the middle of any pre-race anxiety. It also saves you time in the morning so that you can get an extra 15 minutes of sleep. More: Find the right shoes to cross the finish line strong. 4. Get there early. Plan on arriving at the race site early in case there are any issues with parking. This also gives you time to use the restroom (the lines are usually long), warm up, and check your bag. And speaking of restrooms, it is often a good idea to bring a few tissues with you. The port-o-potties at crowded races may run out of toilet paper, so it is always good to have a back up. 5. Do not overdress. A good rule is to dress as if the weather is 15 degrees warmer than it actually is. That is how much you will warm up once you start running. Many races offer a gear check where you can store your bag during the race, so you can always dress in layers and store your extra clothes right before the race starts. More: Stock up on spring running gear.